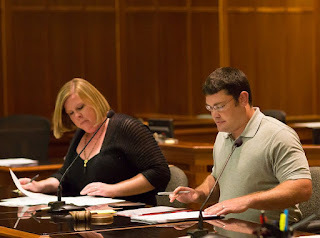 Unlike the Republican duo on the Watauga County Board of Elections, the Lenoir County Republican duo actually voted to reduce all early voting in that county to a single site in downtown Kinston, open only during weekday business hours and on the Saturday morning before the election. They cut the total hours of early voting to less than a quarter of the 443 early voting hours Lenoir County had in 2012. They voted 2-1 on that "plan," which is also being appealed to the State Board of Elections (SBOE) tomorrow (along with Watauga's "minority plan" submitted by Stella Anderson). They voted. Watauga's Republicans Aceto and Owen did not vote, but they're trying to achieve the same thing in Watauga: a single downtown early voting location, with the minimum number of hours. The Lenoir County Republicans wrote a letter to the SBOE piously rationalizing their decision-making: the single site, they wrote, would allow poll workers to “monitor voter fraud more effectively” (NewsObserver). This is the meme that Republicans, from the Cheeto Jesus Himself down to your local Republican apparatchik, have adopted this year: We're not "voters" to them; we're all potential fraudsters just waiting for the main chance to cheat. But who's cheating? The lone Democrat on the Lenoir County BOE told the SBOE in a letter that his GOP counterparts were following the directive from the N.C. Republican Party to reduce early voting: “One of my fellow board members informed me that the two Republican members of the board had been given an agenda from the North Carolina Republican Party that he felt bound to follow, and he hoped I would not take offense at the position he intended to take to comply with that agenda,” Patterson wrote. He was referring, O my brethren, to the now infamous memo written by NCGOP Executive Director Dallas Woodhouse, ordering Republican members of boards of elections to strangle early voting and blame potential "fraud." The evil they claim to see is in their own hearts. Honi soit qui mal y pense. Google the phrase. You'll learn something.